SCVHistory.com | San Francisquito Canyon | Angeles National Forest Copper, Ranch, and Sayre Fires Restoration Strategy, 2016. 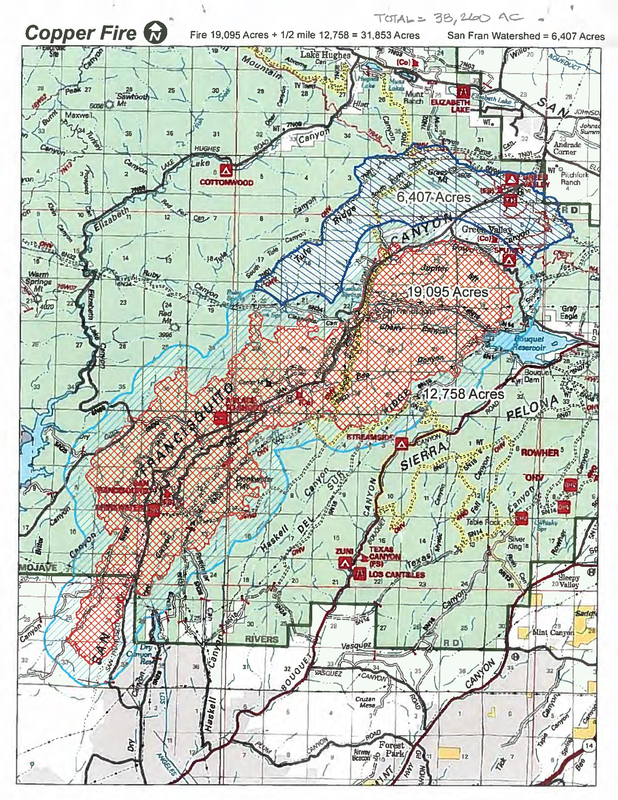 Copper, Ranch, and Sayre Fires Restoration Strategy. USDA Forest Service-Angeles National Forest, 2016. About the 2002 Copper Fire. In 2002, the Copper Fire, occurring predominantly within the San Francisquito watershed, burned approximately 20,000 acres of coastal sage scrub, montane chaparral, grasslands, and riparian corridor, as well as isolated big cone Douglas-fir stands. The intense nature of the fires, coupled with the steep terrain and highly erosive soils of the watershed, resulted in loss of vegetative cover and significant sediment loading to San Francisquito Creek, which in turn resulted in particularly acute impacts to two endangered aquatic species: the unarmored three-spine stickleback and the California red-legged frog. In addition, the loss of vegetation significantly exacerbated encroachment of invasive vegetation throughout the watershed, and facilitated an increase in illegal and damaging off-route OHV use. The Copper Fire also notably reduced the population of an endangered plant, the Nevin's barberry, among other rare and threatened native plant species on the Forest. Along with the natural resources, the Copper Fire affected infrastructure important to the Los Angeles urban area, including power transmission lines for Los Angeles Department of Water and Power and Southern California Edison, a portion of the Los Angeles aqueduct, and lands that drain to Bouquet Reservoir, a source of drinking water for Los Angeles. Many cultural and historical heritage sites were also affected, including the site of the St. Francis Dam failure, a proposed national memorial site. 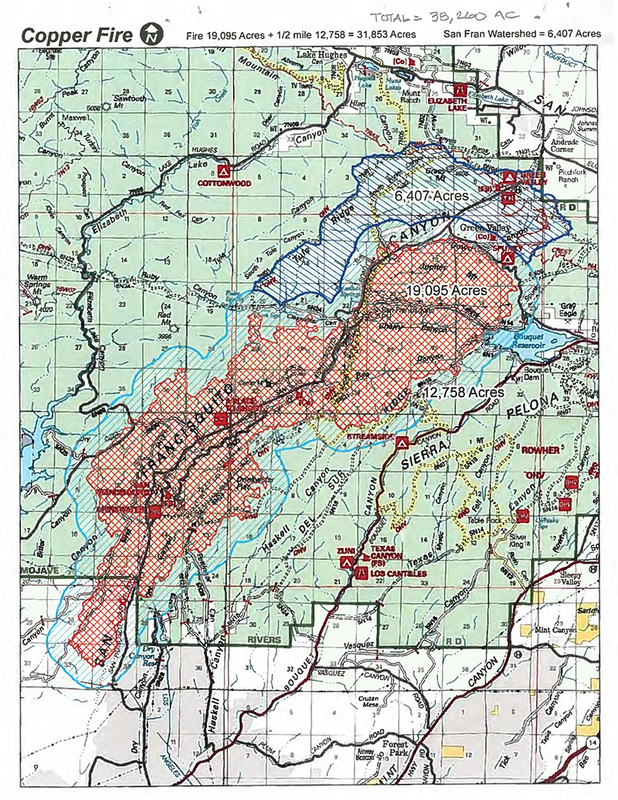 The impacts from the Copper Fire continued well after the initial event, as heavy rains and flooding occurring in 2005 and 2006 were exacerbated by the loss of vegetation that resulted from the Copper Fire and led to significant erosion, sediment loading to San Francisquito Creek and critical California redlegged frog habitat, and damages to the road and road crossings that parallel San Francisquito Creek through portions of the watershed.